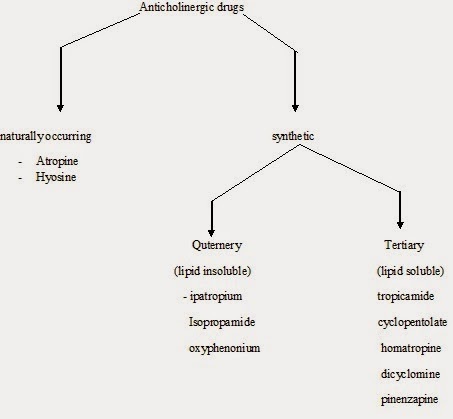 In this article pharmacology and chemistry of autonomous nervous system is discussed in detail. It will help you in mastering the topic and further reinforce your GPAT preparation. Synapse: synapse is the junction region between two neurons. There is no protoplasmic continuity. Myoneurol junction: the junction region between somatic motor nerves of skeleton muscle is called myoneurol junction. 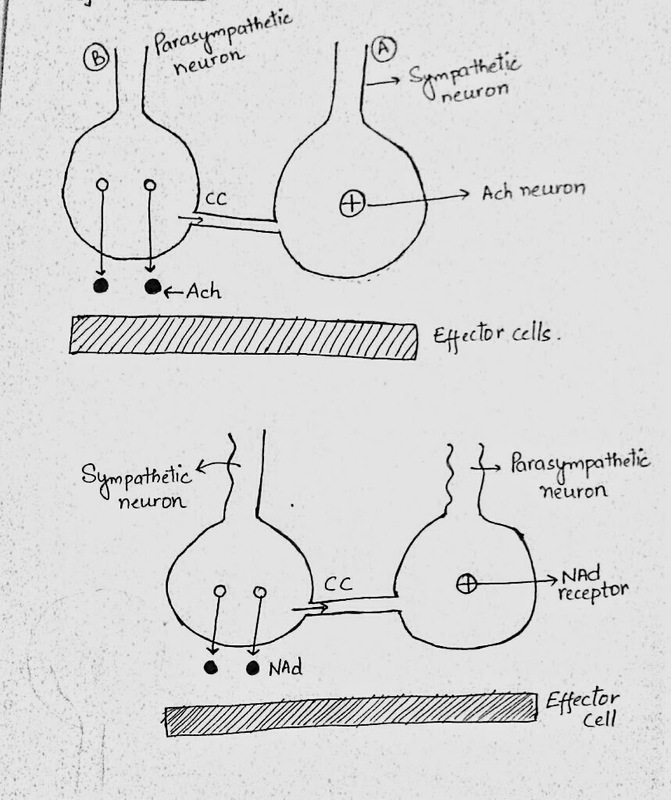 At the synaptic region, axon of the first neuron makes synapse with - dendron/cell soma/axon of second neuron. At terminal part, axon of 1st neuron shows swelling and called presynaptic knob. 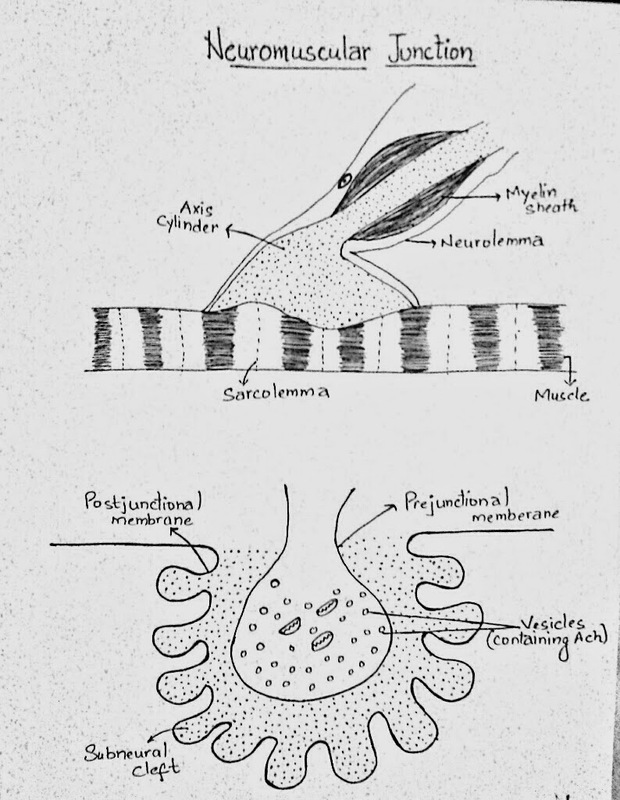 Neurotransmitters are present in vesicles. 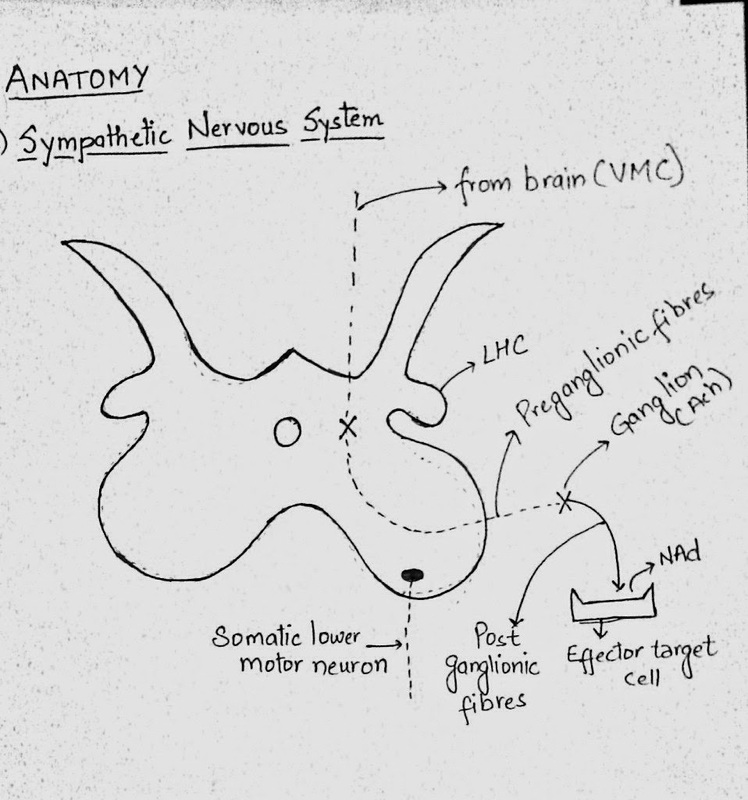 Region between two neuron synapatic cleft (20nm). 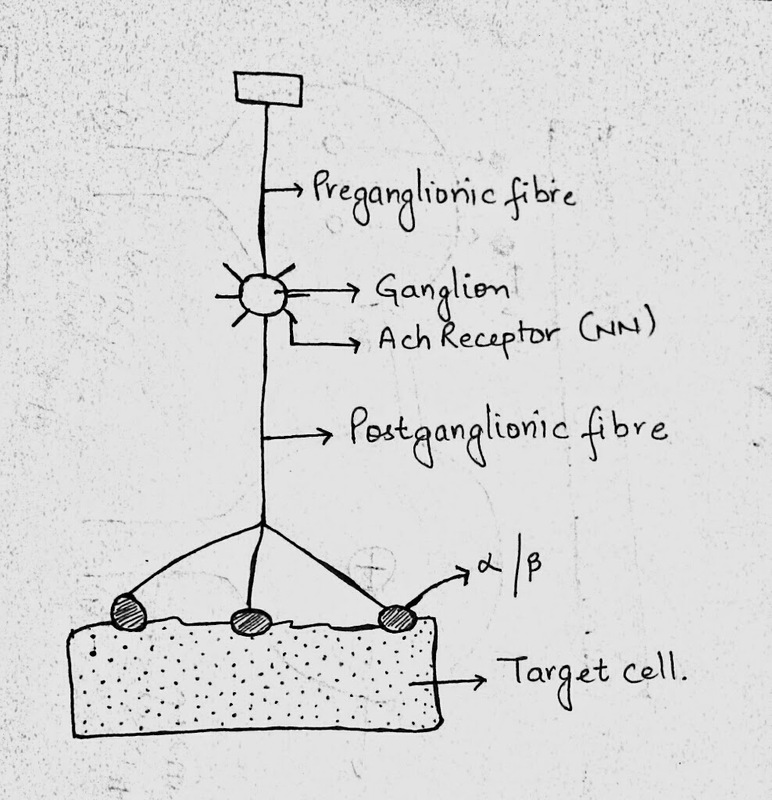 ANS ganglia : axodendric synapse. Anterior horn of spinal cord : axosomatic synapse. First neuron stimulated(Action Potential (AP) generated) ----> AP opens the voltage gated Ca2+ channels and presynaptic membrane -----> Ca2+ enters into ICF from ECF (downhill) -----> Enter Ca2+ cause vesicles to attach with presynaptic membrane -----> Rupturing of vesicle by enzyme of membrane -----> Release of neurotransmitter -----> Neurotransmitter combines with the receptor----> combination of neurotransmitter and receptor. After combining of neurotransmitter, if resting membrane potential falls to -60 mV then AP develops. At ANS- Ach is always the neurotransmitter. Neuromuscular junction is present between the motor nerve twig and the muscle cell. An axon of a motor nerve breaks up into many fine terminal twigs. Each such twigs supplies a muscle fibre. As twig approaches muscle fibre, it looses its mylein sheath and becomes swollen--> terminal bulb. The portion of the muscle fibre where terminal knob is impreganated -----> motor end plate(contains receptors). Subneurol cleft are present on motor end plate. AP in the musucle fibre develops if the membrane potential after lombination of receptor goes to -50mV. James Langley coined the term ENS (father of ANS physiology). Auerbach’s (myenteric) plexus- between the longitudinal and circular layer of gut muscles. Meissner’s plexus- lies in submucons coat. These two plexus consist of large no. Of neurons and do not arise from CNS. Neurotransmitters- 5-HT, Ach, CCK, , Somatostation, NrAd and Dopamine. If a nerve supplying the target organ (skeleton, smooth, myocardium) be cut, after some days it will be seen that application of the neurotransmitter to the target organ produces an usually strong effect. Reasons : a) Increase in no. Of receptor. b) No reuptake as there will be no presynaptic membrane. c) Enhanced postreceptor binding effect. Clinical importance- Drug suppressing the postganglionic sympathetic fibres (guanethidine), when used in a increase hypertensive person for some days and then suddenly withdrawn, can precipitate a denervation supersenstivity like state. e.g.- This person, now on slight excitement can develop reverse vasospasm & hypertension. Sir Henry dale in 1910, used the concept of one neuron one transmitter which is now known as one nerve can produce only 1 neurotransmitter. 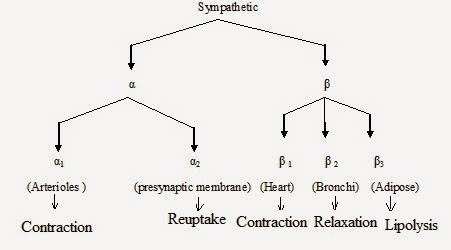 Most organs receive dual supply of sympathetic and parasympathetic nerves. When one nervons system dominates, other suppresses. 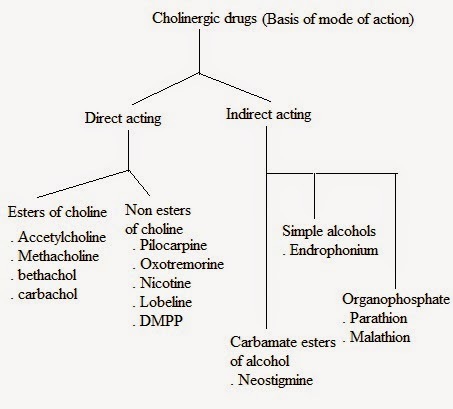 Homotropic inhibition: Consider the example of norepinephrine (NE). 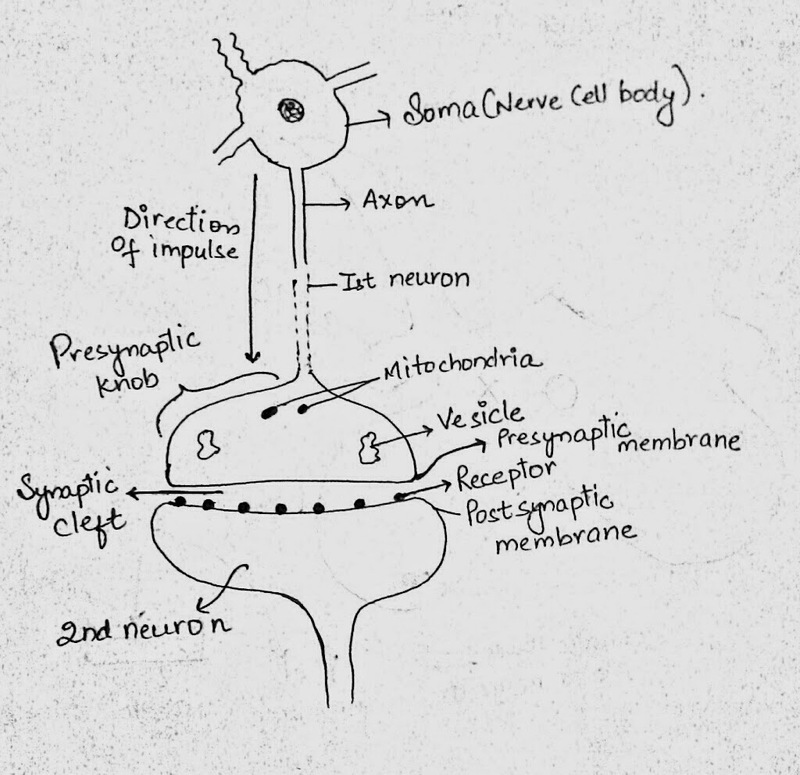 There are two types of receptors: a) Presynaptic (responsible for release & reuptake) b) Postsynaptic (biological action). At low concentration of NE at synaptic cleft- NE binds with beta presynaptic receptors--> +ve feedback. Also, epinephrine released from adrenal medulla cause +ve feedback as it also binds with beta receptor. 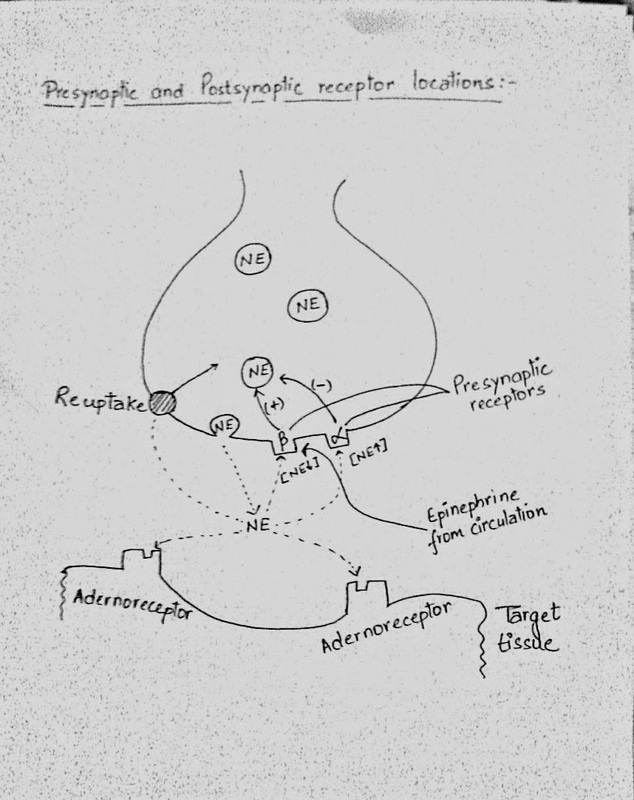 At high concentration NE binds with alpha receptor ---> -ve feedback (Reuptake). These presynaptic receptors are called autoreceptors. Most organ receive dual supply of both devisions. d. APUD cells (gut endocrine cells) ------> Secrete GIT hormones like CCK and Gastrin. 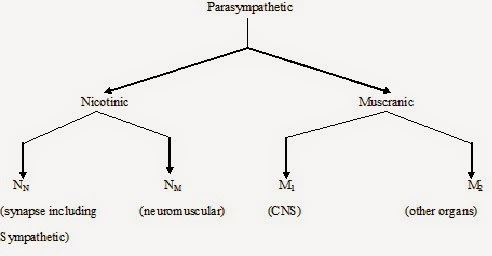 In cranial, 3rd (from Edingero westphal nucleus(midbrain)), 7th (from superior salivary nucleus), 9th (Inferior salivary nucleus) and 10th ( dorsal nucleus of vagus). Together they are call cranial nerves. AcetylCoA is synthesized in mitochondria of synaptic knob. Ach synthesized in cytoplasm of synaptic knob and travels to vesicles and released. c) GIT-------> little effect due to ENS activity also. 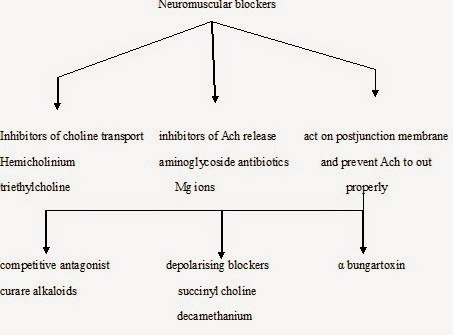 Traditionally, anticholinergic are antimuscranic. So, they are ganglion blockers and neuromuscular blockers. b) Depolarising blockers: Binds with Ach R------> depolarization ------> contraction -----> as depolarising blockers degraded slowly, so contraction prolongs ------> there is no relaxation muscle goes for paralysis. As for second contraction , a fresh depolarization has to occurs but this could not due to prolonged depolarization by these agents. 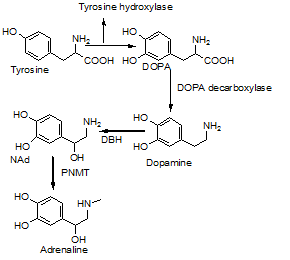 a) β1, β2 and DA1 receptors: Agonists ---------> increased Gs protein ---> activate adenyl cyclase-------> increased cAMP -------> Protein kinase --------> Biological activiy. b) α2, DA2 and M2 receptors: Agonists ---------> increased Gi protein ---> NO adenyl cyclase---------> decreased cAMP -------> No Protein kinase --------> Biological activiy. N atom separated by 2 carbon atoms from benzene ring - increased sympathomimetic action. Effects of α1 blocking: Vasodilation ( Decreased BP) ---> Tachycardia as compensatory mechanism. 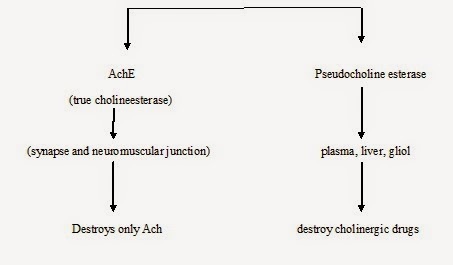 Phenoxabenzamine & Phentolamine- α1 & α2 (blockers) ---> Pheochromocytopenia.